Toyota – Did they put the "brakes" on quickly enough? Posted by Amy Kossoff Smith, Write Ideas, Inc., and PRCG Powerlines Editor. The automaker continues to take a beating in the press over its recall, despite a PR campaign — led by ad agency Saatchi & Saatchi — that includes TV, print, and social media. News broke Wednesday that the Toyota Prius may have a brake pedal problem (which may explain why Toyota’s stock price tumbled nearly 5 percent after Japan’s Nikkei opened Thursday), while Transportation Secretary Ray LaHood said, and later retracted, that people should “stop driving” their Toyotas. Yeah, tough week — and it’s only half over. Amidst the bad news, one PR pro has suggested Toyota consider changing its name. “Is the Toyota name done?” This PR blogger wrote. “After decades of developing a carefully crafted message that Toyota vehicles were safe and superior to American cars, this recall can destroy all that.” Is a name change too extreme? Or should it be an option at this point? Personally, I think that a situation like this requires much more than a name change. How you respond to a crisis, especially when the safety of large numbers of people are involved, is more critical than what you call it. Let’s start with a fast response, humbly acknowledging error, and giving the full story up front, rather than pinching out little pieces of the problem one at a time. It leaves the consumer wondering what will leak next. A name change is something that the media would see right through, and it’s the farthest thing from transparency, which is critical at a time like this. Plus, we all take Tylenol, right? Do you think of their contamination every time you have a headache? They had a major recall last month for one of their brands. 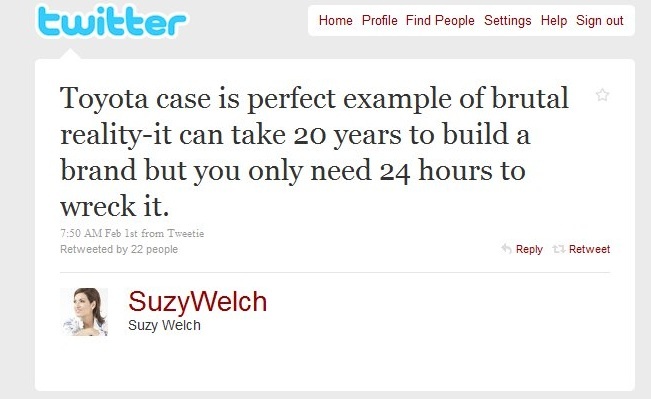 Plus, I love Ragan‘s find of a very aptly tweeted branding comment by Suzy Welch…. So true! With the automotive industry already in the slow lane, this latest crisis could narrow the playing – or driving – field even further, putting many Toyotas in long-term parking! What marketing strategies do you think Toyota should put into play today, next week, and next year, to rebuild brand integrity? Great post! As a long-time Toyota owner (1990-2009), I have been following this closely. First of all, there are very few major manufacturers of any kind who have been immune from a recall at some point. Auto is no exception. Second, I think there are a lot of things that Toyota is doing right – and by the book – given the cards they are dealt. I haven’t heard any fellow Toyota loyalists say that this will impact their buying decision… they are eager to have their cars fixed and move on. Dealers are another problem entirely… but that’s a different post. Bottom line: a name change is a foolish, short-sighted reactive action that would only result in more negative press, especially in the trades. Great topic and great post… thanks! Excellent post! If you’re Toyota, and Seth Meyers leads his Weekend Update on SNL chanting “USA! USA!” with your logo and the words “Major Recall” on the screen http://www.hulu.com/watch/126487/saturday-night-live-update-favorites-feb-6-2010, you know it’s a bad week in PR land. I don’t think a name change is the answer, however. Problems with the Pinto and, before that, the Edsel, didn’t keep people from ultimately buying more Ford cars. Toyota has long enjoyed epic brand loyalty. While this is a major bump in the road, I think the company needs to make some course corrections, communicate its contrition and solution, and keep moving forward.